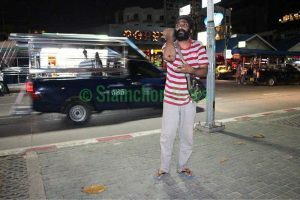 Siam Chon News reported that an Indian businessman was assaulted by “beach mafia” after his group brought along their own mat and sat down to take in the midnight air on Pattaya beach this morning. Baldeep Singh Gulati, 41, was hit in the face and knocked down in the incident that occurred just 100 meters from the Pattaya police station. Rinlada Klahan, 29, said that the victim and another Indian friend were with her and her elder sister. Another Indian came up and started an argument and Thais got involved. They were chased away as the Thais said “this part of the beach has an owner”. She suspected it was people connected to vendors who rent out mats to sit on. The police found no one to arrest and advised the Indian to make a report and they would follow it up. Siam Chon called the attack the work of the beach mafia at the resort.